Jones and Owen Farrell after the game. ENGLAND COACH EDDIE Jones backed Owen Farrell to avoid being cited for a dangerous tackle that could rule him out of next week’s clash with New Zealand as he turned on his critics following a nail-biting 12-11 win over South Africa on Saturday. Farrell had kicked an England side missing several senior players into a one-point lead with his third successful penalty seven minutes from time at Twickenham. But there was drama right at the end when, with 80 minutes on the clock, referee Angus Gardner consulted the television match official to see if out-half Farrell had committed an illegal ‘no-arms’ tackle on Springbok replacement Andre Esterhuizen. But Gardner, despite World Rugby’s current crackdown on dangerous play, eventually decided against penalising Farrell’s challenge, even though it appeared the England co-captain was leading with his shoulder. That, however, may not be the end of the matter with citing commissioner Keith Brown — who is himself from New Zealand — having 24 hours from Saturday’s final whistle to decide if further disciplinary action should be taken. However, a sarcastic Jones said: “You can get cited for something you did at a party when you were 15, anything could happen. “I’ve got no idea what can happen,” the Australian added. But they now head into a clash against the All Blacks at Twickenham on November 10 buoyed by two successive wins. Jones, however, was in chippy mood when asked if Saturday’s success had been the most important win of his near three-years in charge of England. “(The) Most important thing is what we do next,” the Australian said. “I don’t understand this guys. We’re a bloody good team. We’ve lost a few games, we played tough and we won. “Why has it got to be the most important game? Because you guys (the media) want to sack me, is that why? This was England’s first match since Jones had brought former All Blacks coach John Mitchell into his backroom staff as defence supremo. And Jones was delighted by the way his team restricted the Springboks to a solitary try from wing Sbu Nkosi, even if they scored none of their own with fullback Elliot Daly adding a long-range penalty to Farrell’s trio. “When you get in those arm wrestles, someone’s got to give. We didn’t give,” Jones said. However, the former Australia and Japan coach was concerned by yet another match where England conceded a raft of penalties, with lock Maro Itoje sin-binned in the first half. “To beat the New Zealanders you’ve got to be unbelievably disciplined,” he said. England have not played reigning world champions New Zealand since 2014 and next week’s showdown has been eagerly anticipated ahead of next year’s World Cup in Japan. “New Zealand’s a different kettle of fish to the Springboks,” said Jones, Australia’s coach when they lost the 2003 World Cup final to England in Sydney and a consultant to the 2007 world champion Springboks. Email “Defiant England coach Jones backs Farrell to avoid citing”. 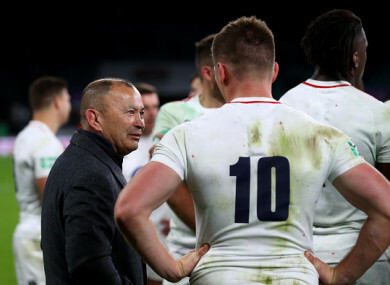 Feedback on “Defiant England coach Jones backs Farrell to avoid citing”.